He goes on to mention the sign is used to signal increased speed ahead, as well as decreased speed, which I don’t think is actually true (please confirm, any engineers). But his point about the vagueness is well taken. The sign, after all, doesn’t tell you how much the speed is dropping by (or exactly when). As it turns out, the engineers have heard his cry of confusion, and the sign as pictured above is on the way out, according to some chatter on the MUTCD websites (this site shows some of the new configurations, which are yellow rather than white, and state specific decreases — never increases — in speed). As a side note, there’s also some discussion about what the proper placement is of these signs — so drivers have sufficient time to react and slow before hitting a new speed zone and, perhaps, a speed trap. I also like Jeff’s mention of the “Dangerous Intersection” sign. Given that signalized intersections account for a very high percentage of traffic crashes, perhaps this should be placed at all intersections. I understand the impulse to put up the sign, at least to provide liability coverage; but is that really all that can be done? And does putting the sign up at one location cause one to lower one’s guard at other areas not so marked? Tricky stuff, this traffic engineering. 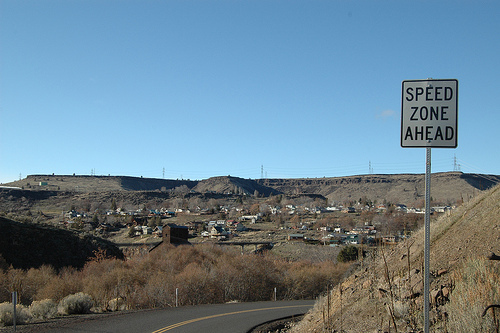 Comments Off on ‘Speed Zone Ahead’ and Other Types of Road Ambiguity. Click here to leave a comment.